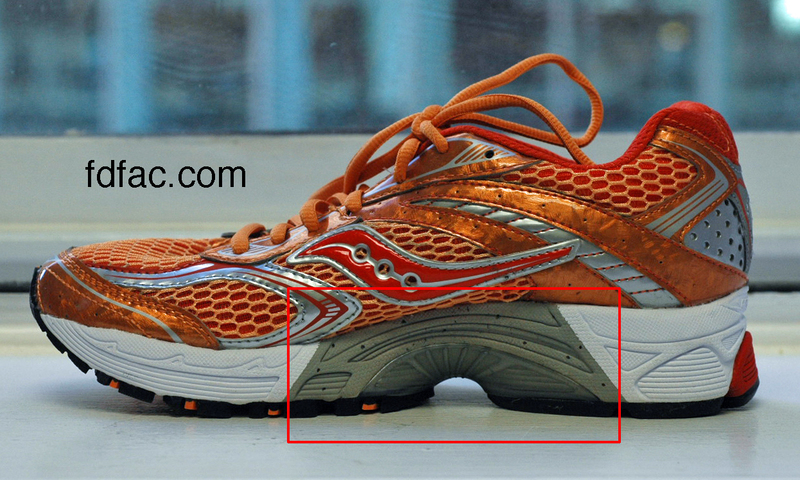 Saucony ProGrid Guide 4 is one of my favorite shoes. The upper has a generous amount of mesh which improves airflow, lightness and comfort. Mesh is also helpful if you have bunions or hammertoes. The rearfoot midsole is thick providing maximum cushioning at heel strike and the firm medial EVA (grey) helps resist pronation and improves stability. The width is not too narrow and not too wide. 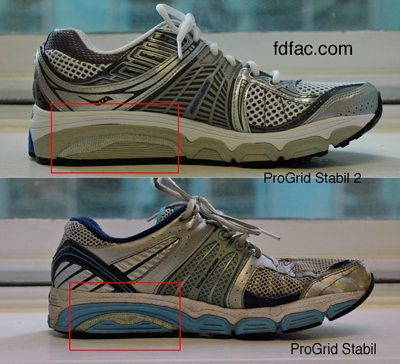 This image compares Asics 2160 to Saucony ProGrid Guide 4. 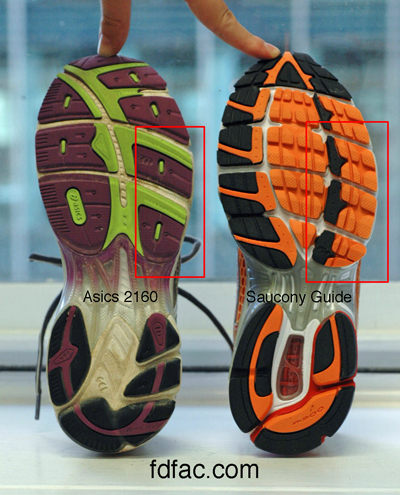 Notice how the Guide 4 outsole is slightly wider in the forefoot than the 2160? 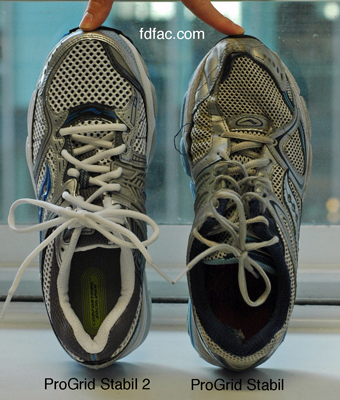 This is a great feature as most feet are slightly wider in the forefoot than rearfoot. 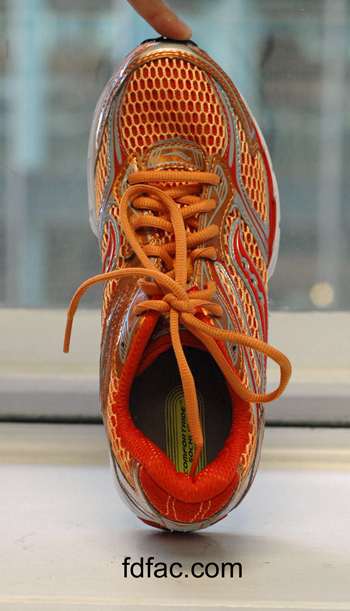 All in all, Saucony ProGrid Guide 4 is a great shoe and I also like the new bright colors. 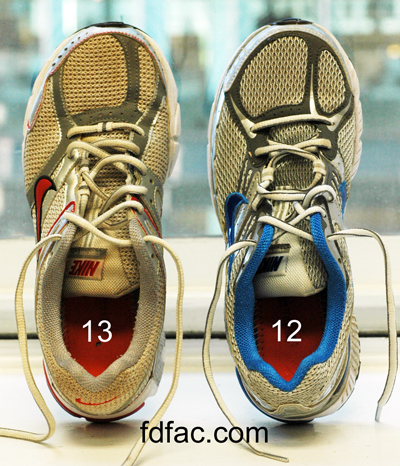 I’ve been a fan of Nike Air Structure Triax for quite sometime, however there are some changes with version 13 that you should be aware of if you’re upgrading from version 12. 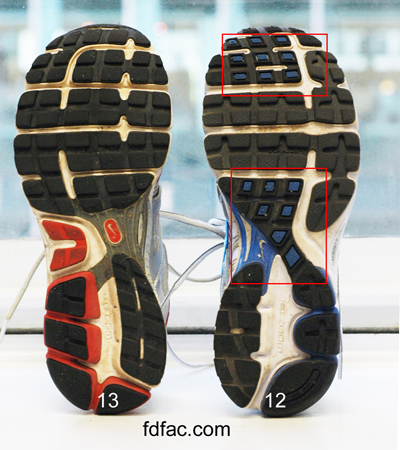 First and foremost the Triax 13 is almost a full size shorter, heel-to-ball, than the Triax 12 https://drshoe.wordpress.com/2007/12/05/size-matters-heel-to-ball-vs-heel-to-toe/.This can cause conditions like plantar fasciitis (arch pain) or metatarsalgia (ball of the foot pain) so make sure to check the size before you buy. 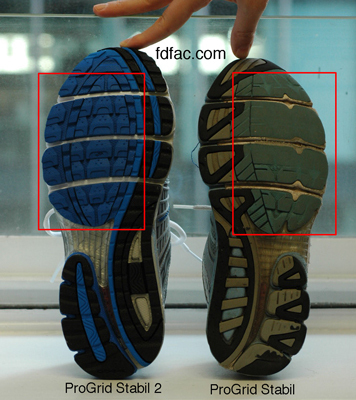 Lack of firm EVA caps (blue highlighted areas) on the Triax 13 waffle sole also means less durability than the Triax 12. This means you may not get as much mileage as you would in the 12. 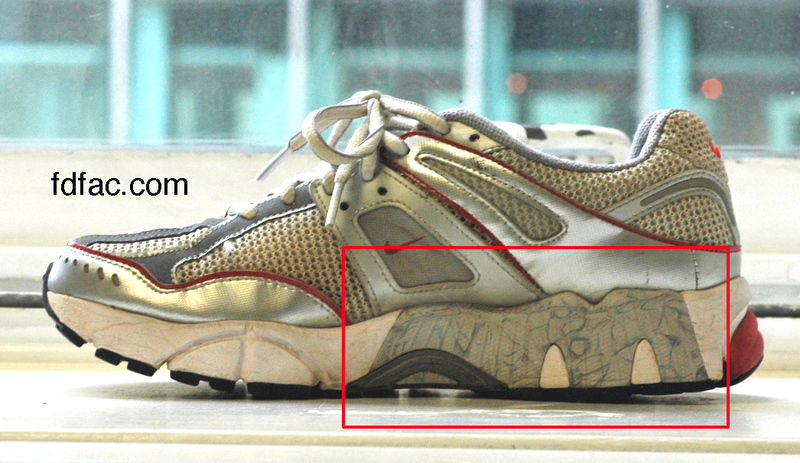 If you owm the Triax 13 you will want to check outsole wear sooner than with the Triax 12. Pluses about Nike’s Air Structure Triax 13 include a firm heel counter and firm EVA in the medial midsole. These features continue to make the Triax one of Nike’s most stable, supportive shoes.